Grand Jury Won't Indict Officers In Ohio Wal-Mart Shooting : The Two-Way The Department of Justice says it will begin a review of police department procedures in Beavercreek, Ohio, where officers fatally shot a 22-year-old black man at a Wal-Mart store. 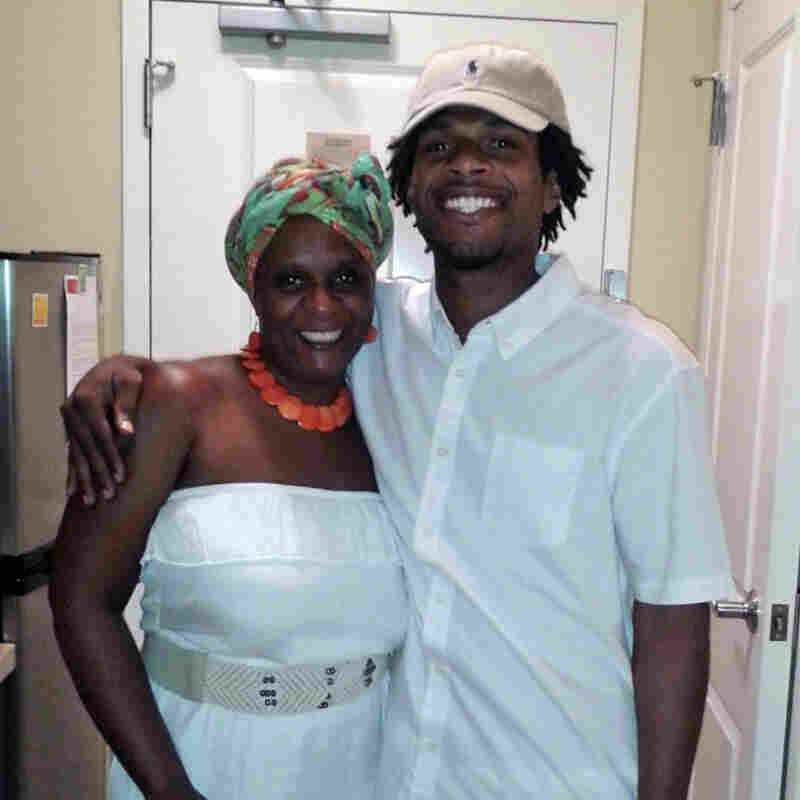 John Crawford III with his mother, Tressa Sherrod, in a photo released by the family. A special grand jury declined to indict officers in the fatal shooting of Crawford by police in an Ohio Wal-Mart in August. The Justice Department says it has begun a review of police department procedures in Beavercreek, Ohio, after a grand jury decided not to indict officers in the fatal shooting of a black man in a Wal-Mart store. The DOJ promised a "thorough and independent" investigation, and said it would take action if civil rights laws were violated. The shooting, which took place on Aug. 5 as attention was focused on events in Ferguson, Mo., occurred when a 911 caller reported a man waving what appeared to be a rifle. According to police, John Crawford III, 22, didn't obey orders to put down what turned out to be an air rifle BB gun. "While inside the store, and on the phone with the mother of his two young children, Crawford stopped in a toy aisle and picked up a Crosman MK-177 air rifle BB gun — an item Wal-Mart sells. "Crawford held the BB gun while walking and talking on the phone. He was unaware that another customer inside the store had called 911. "The first two officers on the scene say they gave Crawford two chances to drop the gun and then fired their weapons when he did not comply. Crawford was hit in the torso and died of his injuries a short time later." "Special Prosecutor Mark Piepmeier says the Greene County grand jury opted not to issue any indictments in the case. Assistant prosecutor Stacey DeGraffenreid says the grand jury had access to photographic and video evidence and heard from 18 witnesses. "'I definitely think a thorough investigation was done,' DeGraffenreid said following a press conference Wednesday." "Crawford's family, which called for a federal investigation to see if race was a factor, said it was 'incomprehensible' that police were not indicted. Crawford was black and the officers are white.
" 'The Crawford family is extremely disappointed, disgusted and confused," the family said in a statement. 'They are heartbroken that justice was not done in the tragic death of their only son.' "